A small frog with a big voice! I came across this small pond frog whilst staying in northern Thailand recently. They were inhabiting water filled lily-pots outside my bedroom at a charming resort called Malee’s Nature Lovers Bungalows, Doi Chiang Dao (1). They made quite a lot of noise, but it was a nice noise and quickly lulled me to sleep! Before going to bed, I went outside and tried to photograph them. They slipped quietly into the water when I approached them with a flash-light, but with patience, I managed to get close enough to some of them and get some half-decent pictures with my pocket camera. It took me a while surfing the Internet before I managed to identify it as the sapgreen stream frog (Rana nigrovittata). At least I think it is! 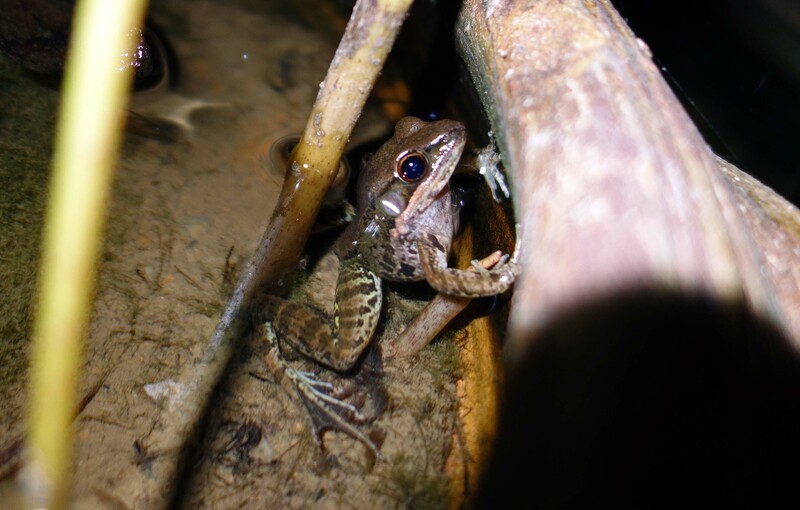 This species also goes by the name of the Black-striped frog, but these individuals shown here do not have a prominent stripe. This species is however, a ‘species complex’ of more than one species and with at least three distinct morphs (2). In other words, there is still a lot to find out about this frog. 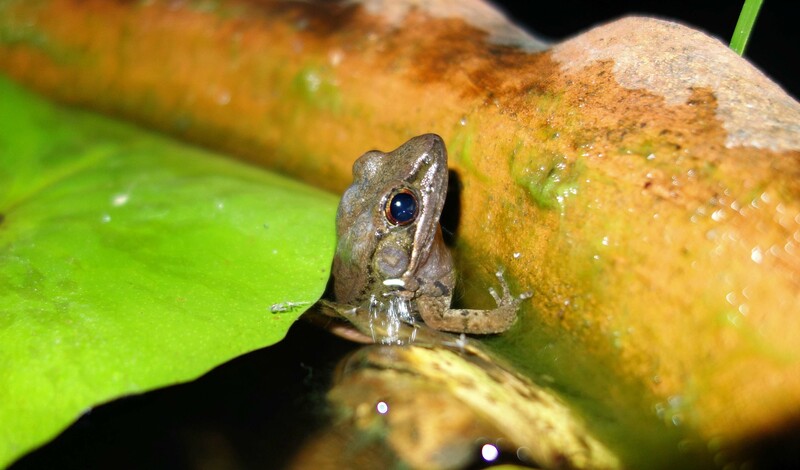 There is a picture of some not very stripy Black-striped frogs on this EcologyAsia website (3) and on another website called Reptiles and Amphibians of Bangkok (4). I also came across some published research work which had found that frogs of this species lived for up to nine years (5). That’s quite a long lifetime for such a small animal; perhaps it takes a long time to learn how to croak well! Thankfully it is not considered threatened and is listed as being of Least Concern ‘in view of its wide distribution’ which extends from southern China down into the northern half of Peninsular Malaysia (2). I forgot to record the ‘song’ (vocalisation) on my camera, so dear reader you will just have to image what a loud noise can emanate from one so small! 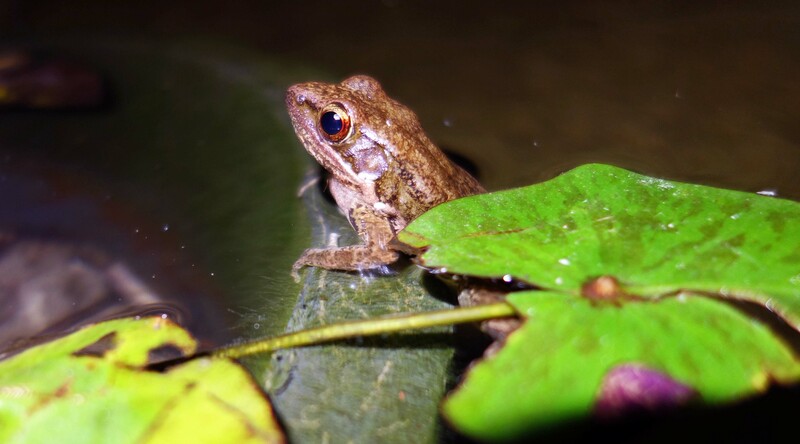 1) http://www.maleenature.com/ 2) http://www.iucnredlist.org/details/58681/0 3) http://www.ecologyasia.com/verts/amphibians/black-striped_frog.htm 4) https://bangkokherps.wordpress.com/frogs/sapgreen-stream-frog/ 5) Khonsue, Wichase, Masafumi Matsui, and Yasuchika Misawa. “Age determination by skeletochronology of Rana nigrovittata, a frog from tropical forest of Thailand.” Zoological Science 17.2 (2000): 253-257. Previous Previous post: Skinks, me thinks, are cool! Ray Cannon's nature notes A small frog with a big voice!